It’s that time of year again. The weather turns cooler again, pumpkin spice creations are inexplicably everywhere, I return from Rhinebeck…and then cast on a Pi Shawl. I just can’t quit with the Pi Shawls. They are pleasing to bundle up in as a kind of carefree accessory, and the simplicity of the construction means I can take them with me as portable knitting for waiting-around time or transit knitting really easily. They are also really great for filling gaps in those times when you want to be knitting something but all the brain cells aren’t quite lining up for you to do something complicated. Since I finished my big granny square blanket a couple of weeks ago, I’m trying to resist casting on ALL the complex cabled things – well, for at least another week at least – so, around and around we go with the Pi Shawl instead! Also, I don’t have a blue one yet. I’d kind of like a blue one. This is some of last year’s Rhinebeck yarn, in Miss Babs Katahdin in a colour that I can’t remember what the colour is and also I can’t find the label, I’m very sorry to report. Something something lost lagoon something? Possibly? Anyway, it’s an awesome watery blue and I like it. What’s your go-to project when you want something simple and mindless? There are so many great simple projects out there. Wow! another one. How many Pi Shawls does that make now? I remember being inspired by you to make my first Pi Shawl and you are correct, they do become addictive! Enjoy it! A solution to lost yarn labels is yarn keys; here you go. to drop a stitch in the Kidsilk Haze; otherwise, lovely to knit with. in progress. I kind of like bouncing from one project to another, depending on my mood. Great projects! If I want something simple I make an easy hat or a really repetitive blanket. I want to make more of my crochet blanket! Well, maybe not mindless but something that didn’t tax my mind while going through an ordeal that is hard to describe at this moment but which might be easy to imagine if I mention that I was on my way to Ireland with my husband who had a cardiac event on the domestic part of the flights and we spent 33 days in Chicago while he had open-heart surgery for the second time. I had my two pair of socks to knit and managed to finish the first pair. The second pair was to be Noro Taiyo Sock Yarn but I couldn’t make my mind accept the results when I got to the heal turn. I ripped them out, found the entrelac instructions on Ravelry that were just right and have knitted the skein into a scarf. I needed a second skein to make the scarf just right and my yarn shop at home was able to send it to me. So, not mindless, but entrelac is a pretty simple pattern and I love what happened while I tried to not think about what just happened to my husband and me on the way to Ireland. Hats. Socks. Hats and socks. I actually have too many hats by now (even though I live in Wisconsin where you ordinarily need hats 9 months out of the year, this freakishly warm fall notwithstanding…) but I’m about to test another one for BabyCocktails here as soon as my yarn arrives! A Nice Ribbed Sock..is a great go to…I do still mean to make the Jay Walkers..
Gorgeous Glenna! A great color indeed, yarn band or no. I love to knit and wear pi-shawls. 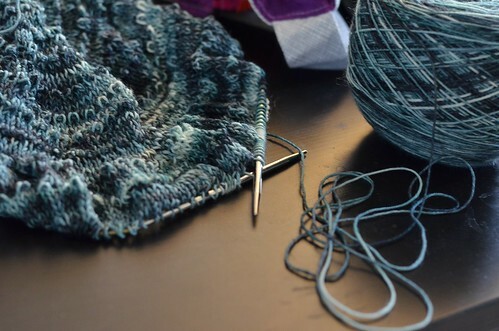 But another great mindless shawl is nuvem by Martina Behm. Very pretty! And you can always adapt the basic pattern to your kntting/wearing needs. I don’t know why but your pictures are plastered all over my blog obscuring my own work!!! 😦 Can you please check to see why this might be – I’ve never seen your blog before today, when I noticed my own blog had been ‘invaded’ by pictures from yours! I’m trying to untangle it from my end – can you do anything from yours, please? Oh, man! I know from where you come with the Pi! My choice is Age of Brass and Steam! 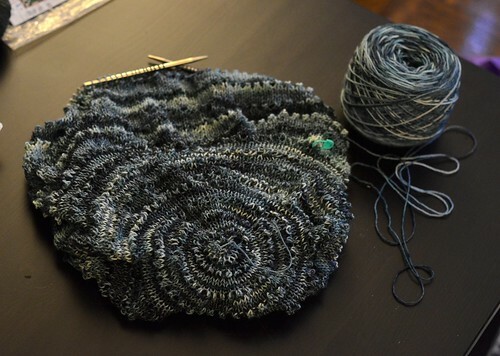 While not the undertaking of a Pi Shawl, it tics the box for a mindless but addicting knit! Yes, watery blue is the perfect description. I just love that colour! Of course you need it to be a shawl.